The driver of a National Express coach which overturned, killing one woman and one man, has been arrested on suspicion of causing death by dangerous driving. The 40-year-old driver of the London to Aberdeen service, which crashed near Heathrow on Wednesday night, is being questioned by police in Berkshire. 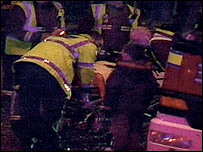 The 69 people on the coach, which included children, were taken to hospital following the crash. Police have confirmed no other vehicle was involved in the incident. The dead woman was later named as Chris Toner, 76, from Monifieth, near Dundee, Aberdeenshire. Doctors said the other fatality in the accident, which happened on a slip road from the M4 to the M25, was a man in his late 20s. Thirty-six passengers, including those fatally injured, were taken to Hillingdon Hospital, in west London. The statement from the hospital said: "Five of these were seriously injured and two, one male and one female, have subsequently died. "Of the three who remain seriously injured, one is in a serious condition suffering from head injuries in the intensive treatment unit, having had a limb amputated. "A second has head injuries and a third has spinal injuries." Trauma consultant David Houlihan-Burne said many of the patients came in with their wounds contaminated by mud and grass. He said medical staff had a well drilled emergency plan as they were so close to Heathrow airport. Other casualties have been taken to various London hospitals and one in Slough suffering from a range of conditions, including broken bones, dislocated limbs and back injuries. James Lant, told the BBC how his stepbrother, 69-year-old Michael Milbourne, was returning to Scotland after spending Christmas and New Year with his family in London. He said Mr Milbourne suffered a fractured vertebra and a cut to his head. He said his stepbrother told him how the coach was going on to the slip road on the M25 when it veered to the left then right and then went out of control. "He was in a bad way. There were people distressed all around him and inside the coach people were on top of one another," said Mr Lant. "He was trying to help people but he couldn't really move because of his back." The coach was a number 592 service, which left London Victoria at 2230 GMT and was due in Aberdeen at 1030 GMT. As well as the 67 passengers, there were two drivers on board the service, which was due to stop at Heathrow Airport, Carlisle, Hamilton, Glasgow and Dundee. National Express chief executive Paul Bunting said most of the passengers were going to Glasgow. "It's quite likely there were holidaymakers and certainly some foreign nationals on board as well when the coach left Heathrow," he said. 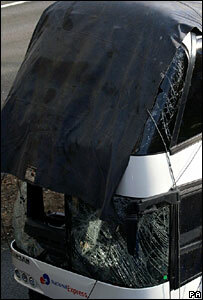 The coach has been moved to a garage in Oxfordshire where it will be examined by accident investigators. Investigations surrounding the circumstances of the crash are continuing. Are Britain's roads getting safer?